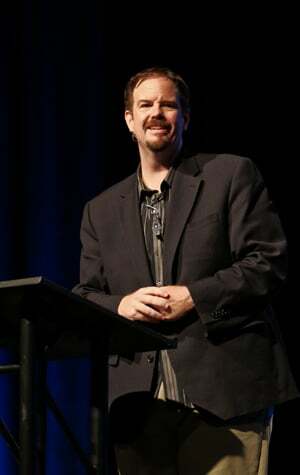 Ed Stetzer has planted churches in New York, Pennsylvania, and Georgia and transitioned declining churches in Indiana and Georgia. He has trained pastors and church planters on five continents, holds two masters degrees and two doctorates, and has written dozens of articles and books. He is also visiting professor at both Trinity Evangelical Divinity School and Southeastern Baptist Theological Seminary, as well as serves on the Church Services Team at the International Mission Board (SBC). He is currently the President of Lifeway Research and Lifeway’s Missiologist in Residence. The title of Dr. Stetzer’s message was The Brave New World of New Media. He began by noting that we need to think biblically and missiologically about new (social) media. Dr. Stetzer started blogging in 2007, and then jumped into Facebook and Twitter. Social media has forever altered how we interact with each other. There are over 200 million blogs, and over 60 million Facebook updates a day. The average user is spending 65 minutes on Facebook. In March, Twitter posted its 10th million Tweet. We need to use these tools to advance God’s purposes. To not do so is irresponsibility. 1. Social media can facilitate or support community. It is not a replacement for biblical community, but it can be a supplement for it. Some churches have members-only portals, and these facilitate and assist community (prayer requests, conversations). Many churches have foregone church newsletters in favor of blog communications. Electronic communication saves postage. 2. It can assist in inspiration. John Piper would Tweet encouraging remarks, that others would reTweet. 3. It can assist the church to be missional. In the case of disaster relief, social media can allow immediate communication on where needs are greatest. Stetzer’s church has used this in a recent flash flood which wreaked havoc in his area. 4. It can assist in introductions. Stetzer noted that he just met Challies today, but that he already knew of him via his writings. So social media becomes a form of introduction. For example, people who “follow” Stetzer on Twitter are aware that he takes his girls out to breakfast on Saturday mornings. Thus they have been introduced to an important window in Stetzer’s life. The dangers, though real, should not keep us away from using electronic communication. 1. It is often the wrong people who engage in social networks. These people are not connected to a church and social media is their only outlet with which to engage. They “drive by” numerous blogs, posting the same thing. Harping on their hobby-horse. 2. Social media can trivialize important truths. Not everything can fit into 140 characters! We can reduce things beyond their capacity to be reduced. We contribute to a “sound byte” culture which does not encourage deep thought and conversation. 3. It creates false community. The people who “follow” us on Twitter cannot come over and encourage us when we are feeling down. We can think we have deep friendships, but be fooled. 4. It can facilitate pride. We go places and others say, “Ed Stetzer has X thousand follows.” There is a degree of narcissim that is present in social media. We use Twitter to drive people to things we’ve accomplished and places we’ll be speaking. We need to remember that blogging and Tweeting can become all about me. 5. Social media encourages impertinent speech. We make assumptions about others and say things about Christian leaders and others that are impertinent. Some of what we write: Would we say these things to the people if they were right in front of us? Technology without accountability leads to self-centeredness, not gospel-centeredness. 6. Those behind Facebook and other such pages are in it for financial gain. Be aware that Facebook doesn’t want us to have “private” pages for our “real” friends. Why? Because they cannot monetize it. People are recognizing that social media is shaping us as a culture. We need to engage in these conversations discerningly, modeling community, and promoting the kingdom of God. Ed is on Twitter at http://twitter.com/edstetzer.